In sixth pAsuram – AzhwAr says bhagavAn alone is the Iswara (controller) since he protects all chith (sentient) and achith (insentient) by keeping them in his stomach (during praLayam – dissolution). Subsequently, AzhwAr says emperumAn is resting in kshIrArNavam (milk-ocean) to protect his devotees. Sixth pAsuram – since he is the one who helps during difficulties, AzhwAr says that he is the Iswara (controller). 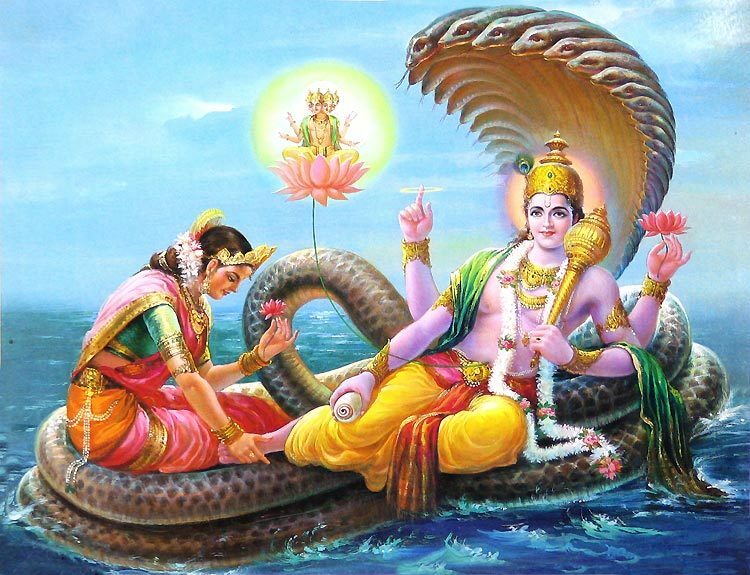 Our lord and master, who effortlessly consumes all objects – chEthanas and achEthanas, and keeps them inside him (his stomach) and stays having vast and abundant knowledge as his glow, who is enjoyable for us is resting in the spectacular milk ocean. sudar mUrthi can also be explained as vigraham (divine form). thannuL odunga ninRa – As explained by mArkaNdEya rishi to yudhishtra in mahAbhAratham AraNya parvam “thadhapaSyam aham sarvam thasya kukshau mahAthmana:” (I have seen inside vishNu’s stomach all movable/immovable objects that are seen here now). It can also be explained as within a small portion of his divine will. pavarkoL gyAnaveLLach chudar mUrthi – Having the vast abundant knowledge that is required to protect them, and having a divine form that manifests his emotions “I am so happy to protect them”. em Azhi am paLLiyArE – Since he is in this samsAram (material realm), he speaks on behalf of all the residents here and says “to protect us, you have descended here and having this kshIrArNavam as a beautiful bed”. It is explained in thamizh nigaNdu (grammar book) “pAyalum paLLiyum pAzhiyum padukkai” (Bed is indicated by the following words pAyal, paLLi, pAzhi). Thus, he is the Iswara (lord and master) because he is the one who helps during difficulties and he is most beautiful. This entry was posted in thiruvAimozhi, thiruvAimozhi 2nd centum on January 30, 2016 by Sarathy Thothathri.